At the Council of Writing Program Administrators 2017 Conference in Knoxville, I presented about my integration of science fiction with multimodal composition. The slides and abstract are as follows, and I also plan to expand on this for my next book project. ​As universities increasingly privilege STEM education, composition instructors can maintain an institutional foothold by designing their courses to serve the needs of students in aeronautics, computer science, and similar fields. Specifically, I draw on science fiction because it engages first-year students at Georgia Tech with rhetorical arguments about the ethics of contemporary technologies. Texts such as Kim Stanley Robinson’s Red Mars and Frank Herbert’s Dune likewise challenge these students to speculate about the ramifications of the tools that they might invent in the future. Furthermore, I argue that science fiction can provide an ideal groundwork for fostering multimodal projects so that we can train students to be effective not only as writers but also as public speakers, visual designers, and electronic communicators. Future-oriented thinkers such as Ray Kurzweil imagine how we might evolve into posthumans. Likewise, I propose that we think about cyborg forms of composition, particularly as our students face an uncertain future. 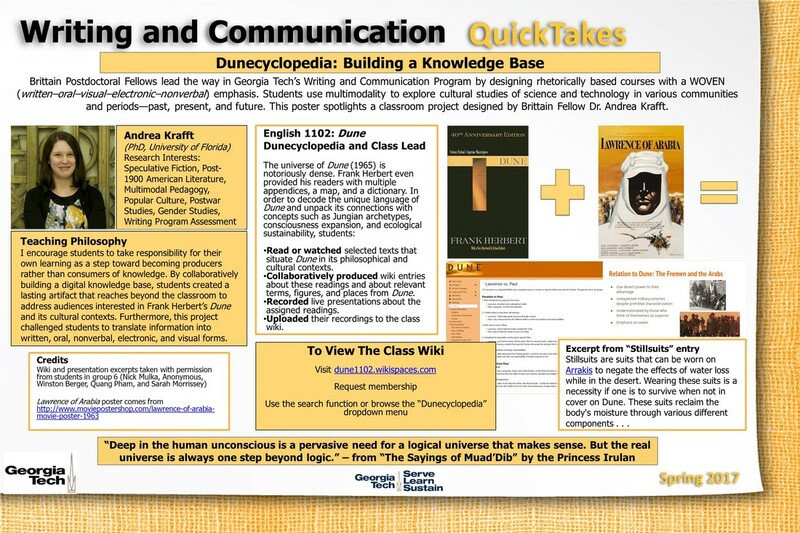 ​​​Each year the Center for Teaching and Learning at Georgia Tech invites instructors to a poster display session to highlight classroom practice, curricular innovation, and other strategies for enhancing student learning. 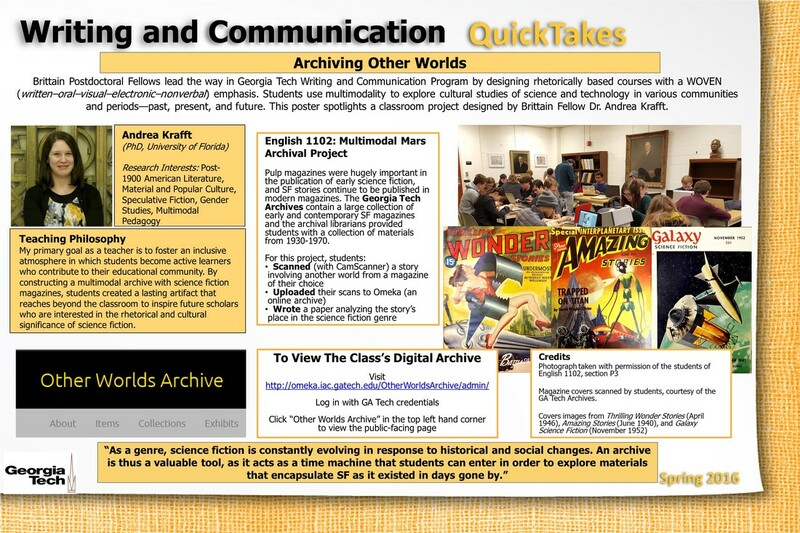 In spring 2016, I presented about an archival assignment using science fiction periodicals. I also wrote a blog post about this assignment for ​TECHStyle. ​In spring 2017, my poster dealt with a collaborative wiki assignment in which students researched the cultural contexts of Dune​. 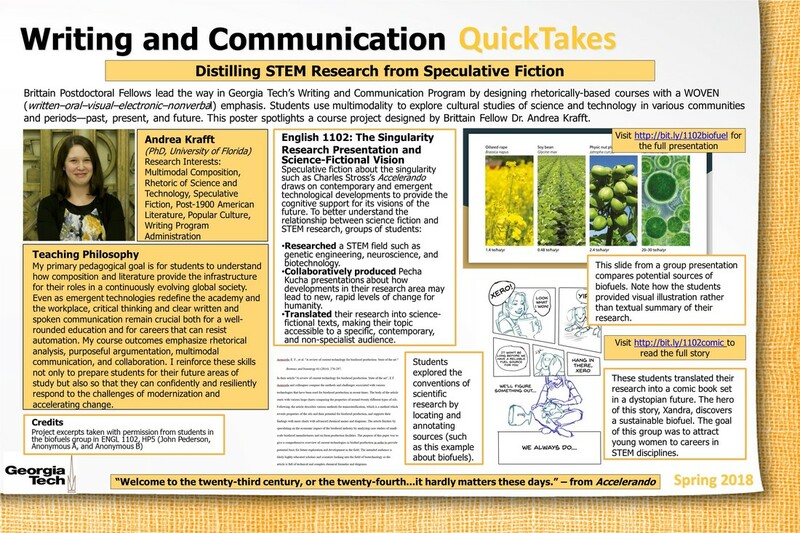 ​In spring 2018, my poster addressed an assignment in which students designed Pecha Kucha presentations about contemporary developments in fields such as genetic engineering, neuroscience, and biotechnology. I also presented this poster at the 2018 Georgia Tech Astrobiology Colloquium.